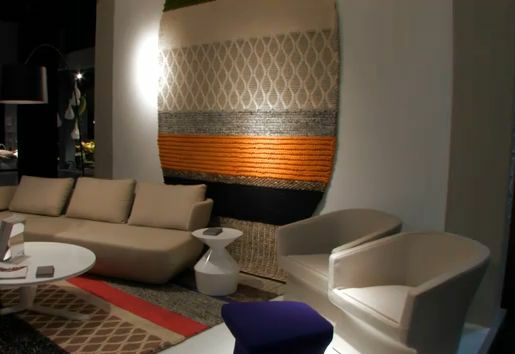 2011 INTERIOR DESIGN TRENDS- WHICH ONE SUITS YOUR STYLE? Would you like to know which is the MFADQ in January? 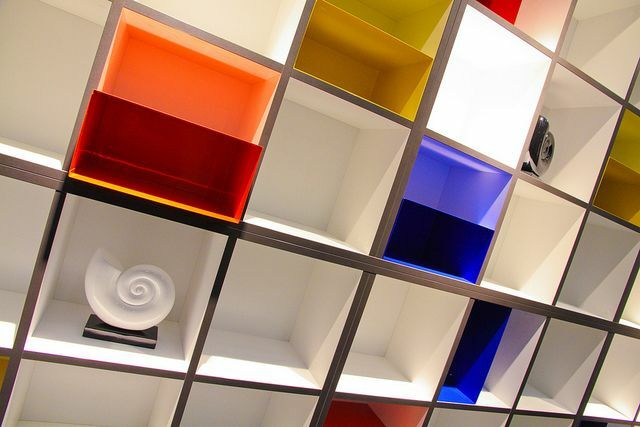 You may have guessed, the most frequently asked design question is “what are the color trends for this year?”. 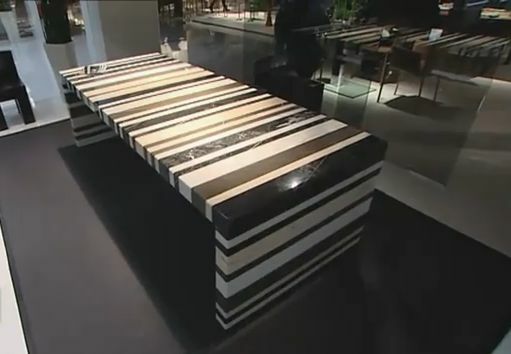 If you’re not new to my blog, you probably read about 2010 color trends, european design trends, fashion trends. Trends are not accidental, in fact, they are very much connected to how we live and transform our lives every day. Think of how much technology has influenced furniture design, automobile design, and fashion design. Every year there are new trends in all areas of design, and while most people want to know which colors are trendier in 2011, there is more than color to explore. If you search online for design trends you will find so many opinions and trendsetters that you may not quite understand how to use each trend. In fact, many trends vary from one company to another, which could be very confusing! 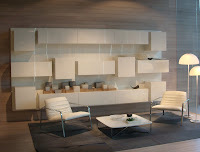 I will try to translate some of the design trends and show you an easy way of recognizing if any of 2011 trends is for you. Among all 2011 design trends, there are few that caught my eye especially as they are more oriented towards working around a personality as a trend instead of just a color or a pattern. I think this year will be more about comfortable spaces and when you know how to combine "comfortable with stylish" you've got a pretty great space! 1. COLOR- when it comes to color, each paint company has its own colors as defining for this year’s trend. Some chose what I call “happy colors” as a response to the global economy in much need for some happy news! and others chose “relaxing colors” in response to our society emotional stress. According to Pantone Color Institute, 2011 color of the year is Honeysuckle- 'A Color for All Seasons Courageous. Confident. Vital. A brave new color, for a brave new world. Let the bold spirit of Honeysuckle infuse you, lift you and carry you through the year. It’s a color for every day – with nothing “everyday” about it.' I would recommend to use this color wisely as it is a stimulant color. Here are two examples showing one of the best way to use this color so it doesn’t become overwhelming in any space. Use a background of a neutral color, ideally a cool light neutral color and play with monochromatic textures- then insert this color as an accent just for an eye catching effect. 2. 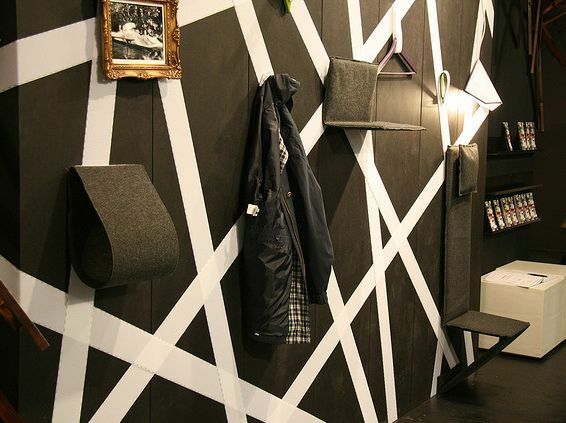 Trends by Heimtextil -the biggest international trade fair for home and contract textiles held in January every year. They came up with 4 interesting trends, all four concepts are very easy to implement in any home design. SOBRIETY– ‘a return to the essential and traditional- The new consumer landscape is characterised by quality, longevity, sustainability and significance. The Sobriety trend theme shows where short-lived, seasonal trends end and consistent value begins.‘ If you ever thought of creating a timeless design for your home that would not be affected by any trends, this is for you. 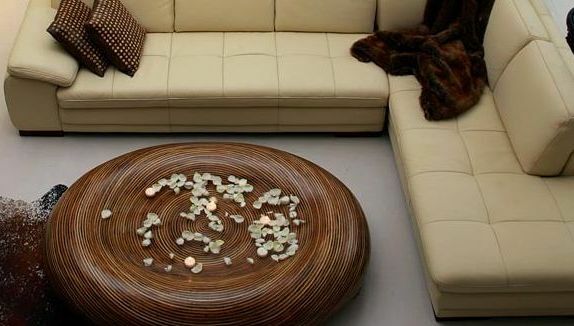 Here is an image of a seating area you could create in your living room. The classic, simple and elegant style of the sofa and armchair will never lose their charm. You could play with the area rug and accessories that will add a tone of “trendy” to your overall furnishings. MIX MASH- 'combines the high-tech with craftsmanship, new with old and it clearly shows how tradition is being turned on its head and stylized ethnic influences from all over the world meet with novel patterns, prints and fabrics.' Think for example of how you could create a clean contemporary design for your condo and still have some key pieces of your own cultural heritage or great findings from your travels. 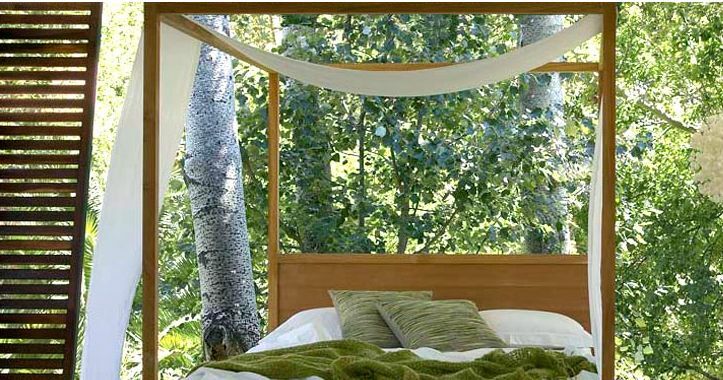 WILDERNESS STYLE- which means being at one with nature. 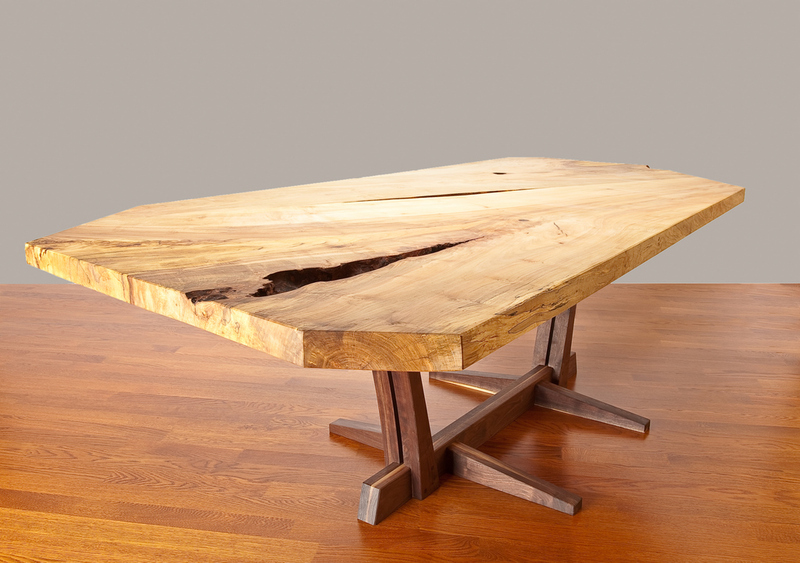 A new interest in crafts from the past, including milling and wicker-weaving are evolving. People are looking for distinctive individualistic features marked by imperfection not perfection. A new organic look is being created. While many of the new trends will make you wonder if... "should I change my current design to be more trendy?" or "how much should I tweak to create a trendy space? 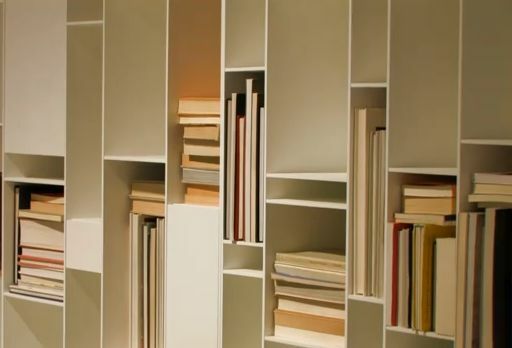 ", I can assure you that any space made to look and feel comfortable will be a great start! But if you would have to choose one of the trends from above, which one would be your fav and why? 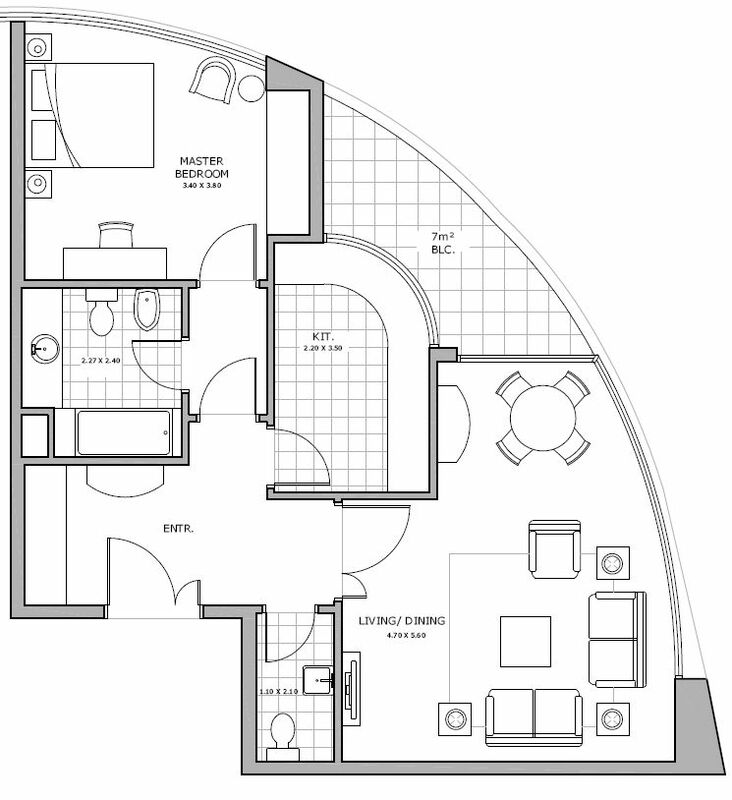 YOUR TOP 5 QUESTIONS ABOUT CONDO FLOOR PLANS ANSWERED! As soon as the New Year started (Happy New Year! 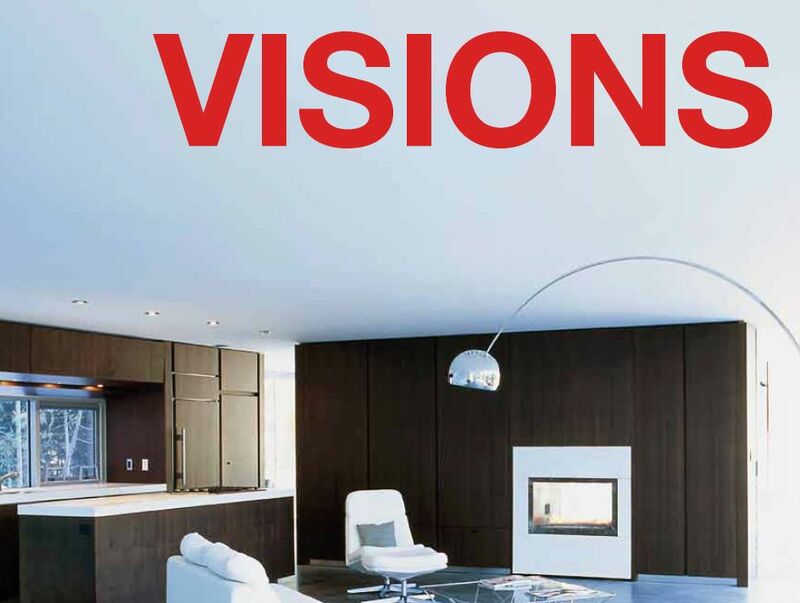 ), buying a new condo is already on many people’s goal list for 2011. While travelling for the past couple of weeks I could not help but notice how many people talk about their condo. I love finding great design inspirations from hotels and resorts where people go to relax and enjoy all the services and amenities some cannot enjoy at home. Living in a condo gives many of us the benefits of enjoying a hotel lifestyle and while floor plans vary drastically in size and shape, no one can deny that condo lifestyle has its own tremendous advantages. 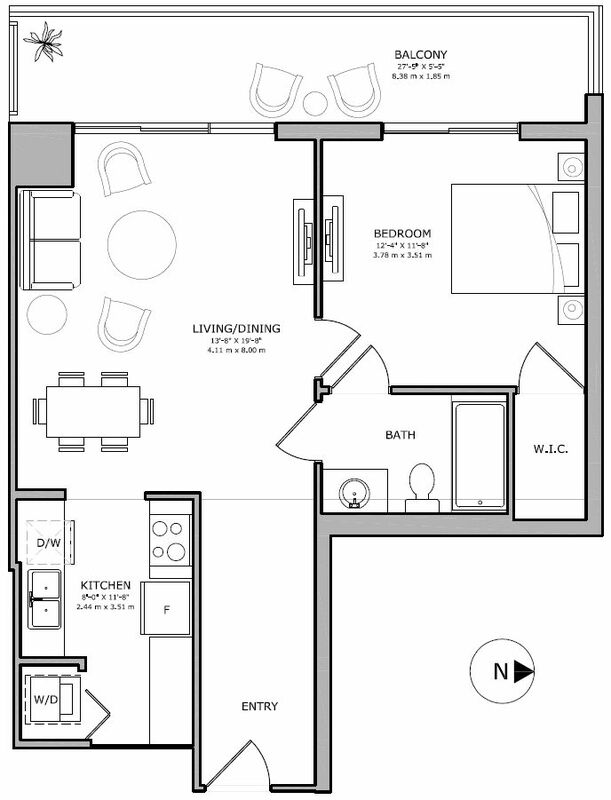 As I was planning to do a comparison of condo floor plans from around the world, I’m happy to share with you some layouts sent in for discussion by our readers! It seems that everyone has the same space dilemmas regardless where in the world their condo is located. 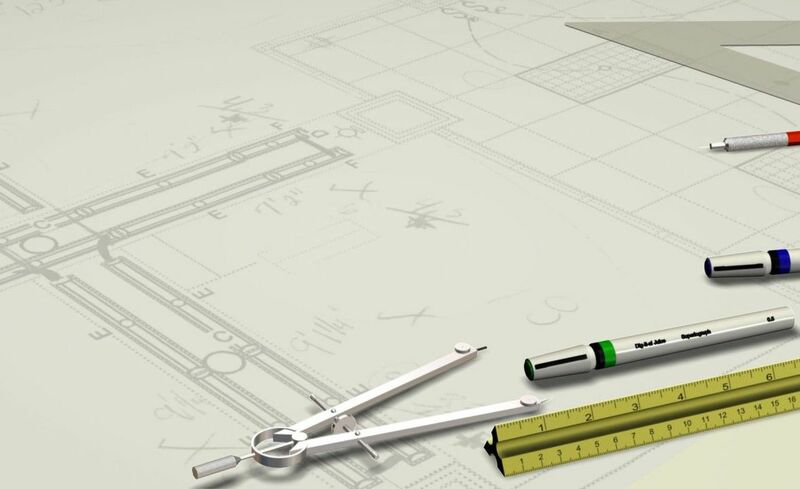 Here are your top 5 questions and answers related to condo layouts. 1. 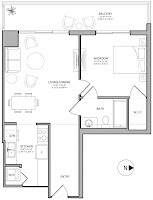 Very small condos- “how to figure out the best layout when looking at marketing plans unfurnished? “Let’s take a look at 2 layouts of very small spaces from Toronto one from Australia and one from Dubai. 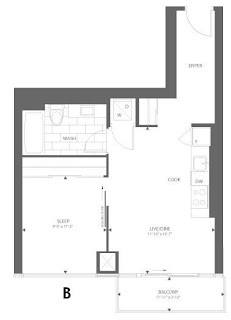 - layout A- 1 bedroom- 477 sq.ft.-Toronto- no wasted space, corridors are embedded in the actual kitchen space, large bedroom closet and wide living/dining area. This layout has a very small kitchen with minimal lower cabinet storage- so assume cooking small meals :) This space will appear very open and bright once built due to the wide living/area wall-to-wall glazing. 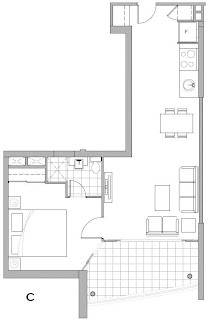 - layout B- 1 bedroom- 523 sq.ft.- Toronto- long entrance corridor- if you read my previous blog posts, this is one feature that puzzles many condo owners as there is no practical use to a long and narrow corridor except for building a custom wall unit for small storage or simply accessorizing it with wall art. An integrated kitchen with the open living/dining area gives you the opportunity to create a custom kitchen island/dining table which will provide more storage! Living area- very small space, hence you can consider a 2- seat instead of a 3- seat sofa. Bedroom-very similar to layout A but if you love natural light in your sleep area this appears to be the bedroom of your choice. - layout C- 1 bedroom-433 sq.ft- Australia- you walk right in the kitchen area, no foyer, small storage space and shower only- however for such a tiny space you basically have a separate bedroom and a dining area! 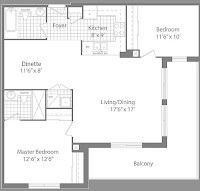 - layout D- 1 bedroom- 546sq.ft.- Dubai- really tiny kitchen, no foyer- you walk right in the kitchen area, large bedroom, however the sharp angle of the living area becomes wasted space whether you furnish the space as shown by the builder or as shown in the alternate furniture layout below. 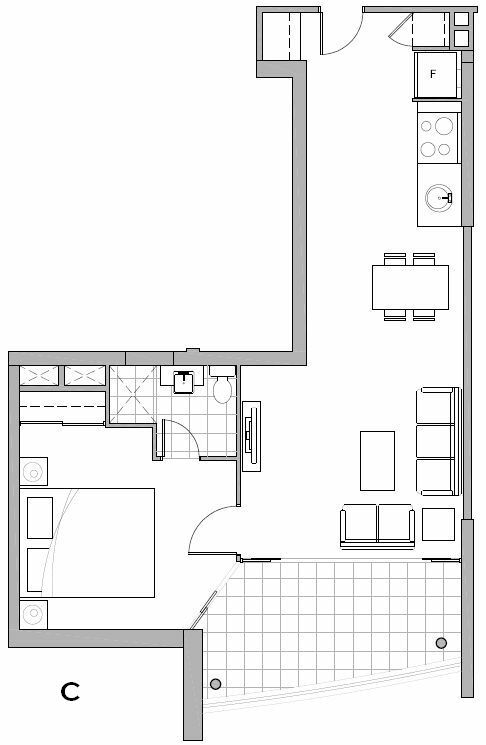 This 2 bedroom + dinette-1100 sq.ft. 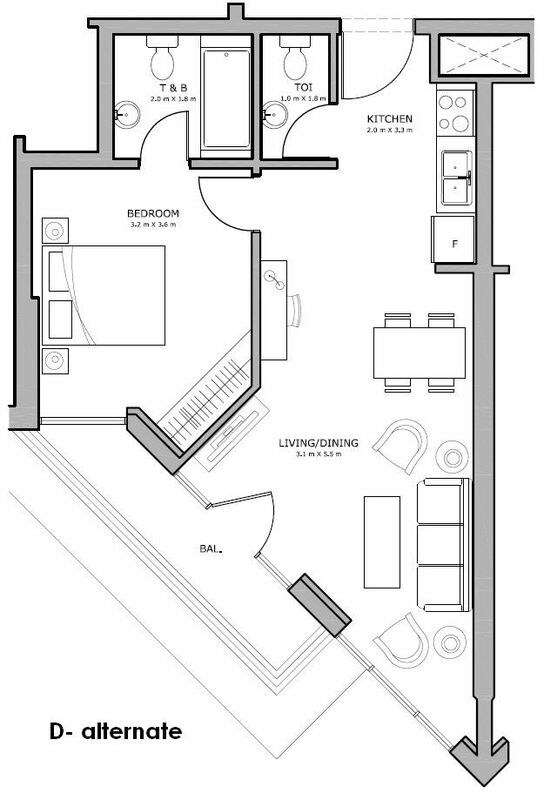 layout of one of the condos located in Vaughan, Ontario seems to be a perfect fit! While the dinette area allows you to create a more formal dining area (very suitable especially for a traditional or classic design), the rest of the space seems to have all elements of a comfortable life style for a couple downsizing from a house to a condo. 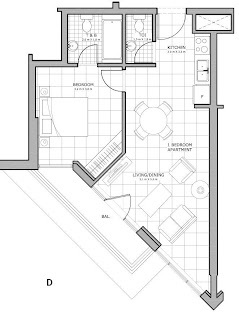 In addition, the corner unit comes with views of two sides of the building and an oversized balcony. This layout allows you to use the dinette also as a den area and have a less formal dining table in the open living/dining space. 3. “Are open kitchens better than enclosed kitchens?” This actually is simply a personal preference. 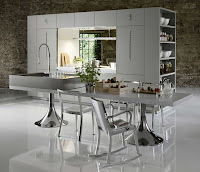 It is hard to say if one type of kitchen would sell more or give more value to a condominium. At the end of the day, it is all about your lifestyle. 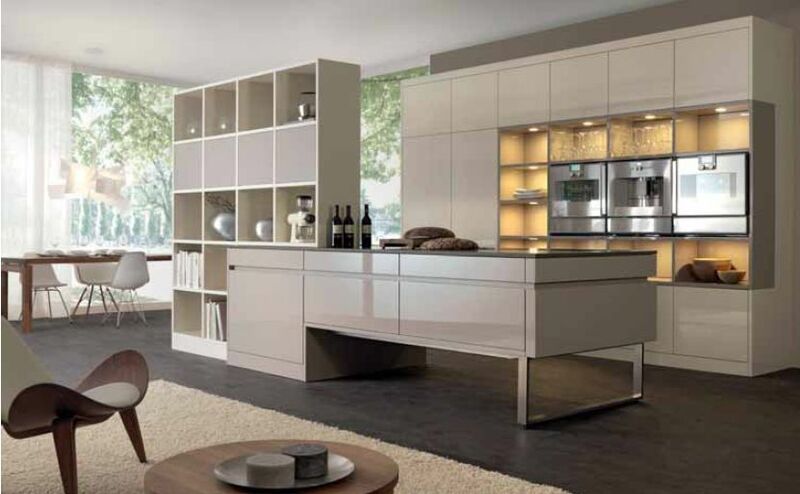 Visually, open kitchens help the overall living/dining/kitchen space to appear larger and support a different lifestyle- one where kitchen is simply not just a place to prepare meals but entertain friends and family. 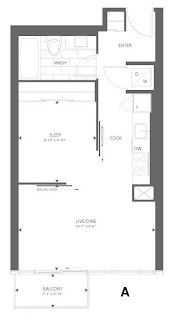 This 1 bedroom-700 sq.ft. 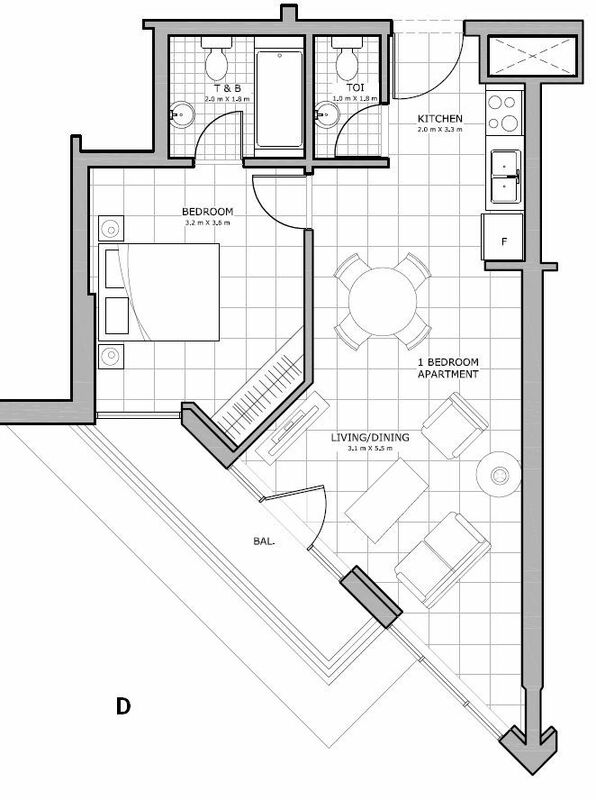 from Miami has an enclosed kitchen running parallel to the main long foyer. You can always consider opening up the kitchen on the corner (assuming the condo board allows you to make that change after you move in). 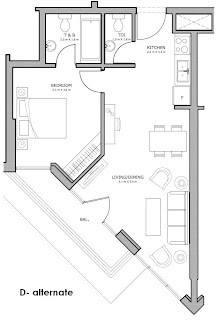 It seems that the living area has more issues than the kitchen layout as it features just a 2-seat sofa?! In addition, the walk-in closet has no extra wall space other than the back wall, thus it looks like wasted floor space. 4. “Are long layouts better than wide layouts?” Again- there is no rule that one layout is better perceived than the other is. However, long and narrow layouts seem to appear like a tunnel for some people used to live in large spaces. The best part of this 2 bedroom-789sq.ft condo townhouse located in Florida is the storage space as well as the size of each room or open area. 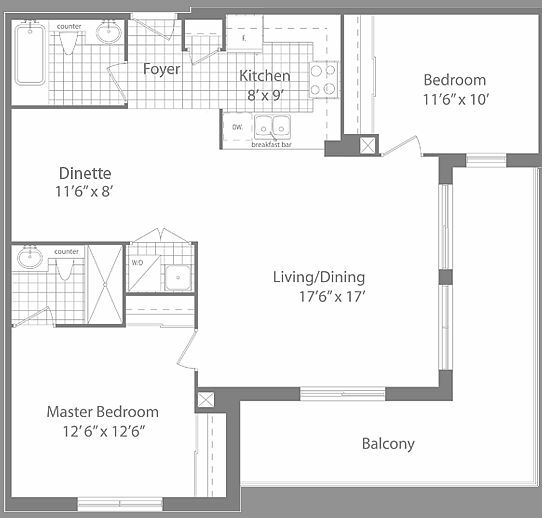 It is great to have walk-in closets in both bedrooms, which are also larger than many bedrooms I have seen. The double vanity is also a great feature for the ensuite and the kitchen looks great. This is a very nice layout! 5. “Are curved buildings compromising the floor plans just for the sake of exterior architectural design?” Great question and long debated over the past few years since more and more buildings appear to have a unique presence in the city. My answer is “No”! If the building is designed to capture the best of exterior appearance and interior spaces, one should not diminish the other. 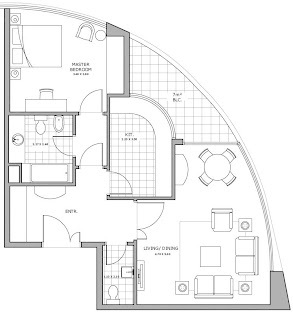 Here is in interesting layout from Abu Dhabi- 1bedroom 814sq.ft. It appears that corners do not necessarily create wasted space, all corridors spaces have been minimized so the actual space is inside each room and while the kitchen has an unusual shape and location compared to North American condos, it sure comes with a great view!